I love shopping for creative bits on the internet but pound shops are just as good when the rain stays away! Today I was creating masks, thinking about emotions and using colours that spoke to me. We all wear a multitude of masks, sometimes to hide emotions and at others to express them. Sometimes we try to lie about what is occurring for us inside by wearing a mask that doesn't match. Making masks and talking about them is a great way of exploring what is going on inside. You can use almost anything, I love PVA glue because it makes everything gloopy and gets everywhere. If you are scared of making a mess get a cheap showr curtain to contain it on. Glitter glue, stickers, paints and pens are great craft materials, but anything you can stick is good e.g. tissue paper, pipe cleaners, cellotape (love cellotape!). 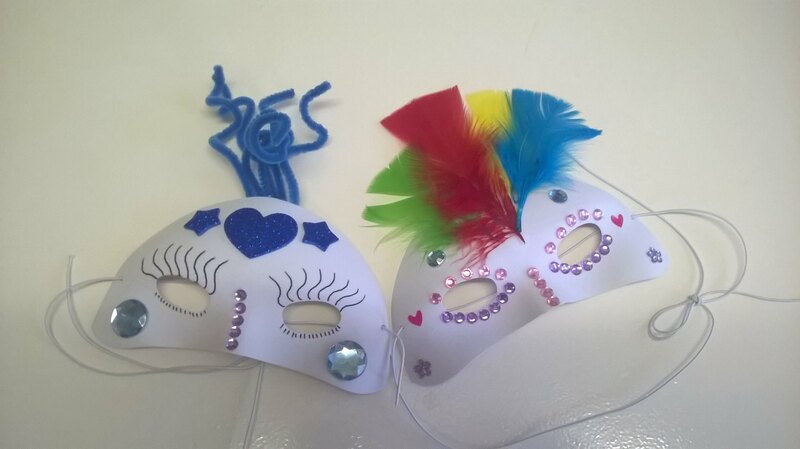 So today I was creating a mask for joy and one for sadness, can you tell which is which?